Vinca minor or trailing perwinkle is a fast growing excellent evergreen ground cover for full sun, shaded and semi-shaded areas. Dark green oval-shaped foliage and conspicuous blue flowers in early Spring. Plant 6 to 8 inches apart. Combines with Pachysandra if each kind is kept in large colonies, not mixed together. Grows almost flat on the ground. 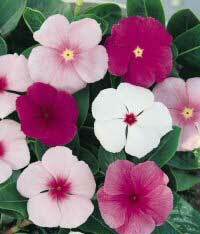 With heat, drought and poor soil tolerance, annual vinca (Catharanthus roseus), also known as Madagascar periwinkle, is a very popular annual. The plants grow 1 or 2 feet high and about the same in width. There are new spreading types that are wider and lower. Most vinca have a dense, rounded form. Vinca is grown as an annual. It will often return in following summers from self-sown seed. 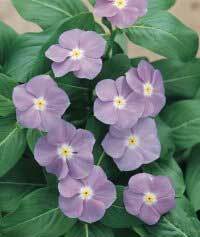 Annual vinca is not the same as the perennial periwinkles (Vinca minor or V. major) that are grown as groundcovers. Vinca has durable, abundant flowers from June to frost. It is now available in a wonderful selection of new colors, larger flowers and even new growth habits. Both creeping and dwarf upright types are available. Vinca is an easy-to-grow annual for beds, borders, edging and containers. Vinca prefers full sun, tolerates heat and drought and can be relied on to flower in the hottest weather throughout the entire summer. Vinca takes a long time to flower when started from seed. It should not be planted outside until the ground is very warm. If planted too early, vinca often develops fungus problems. Improper pH may increase disease problems with vinca. A pH of 5.4 to 5.8 is ideal. Good soil drainage is important to prevent disease. Vinca does not need either deadheading or pinching to maintain its bloom and form. 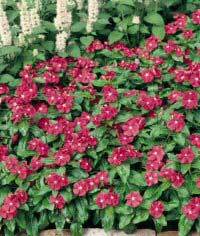 Annual vinca is one of the most trouble-free bedding plants. 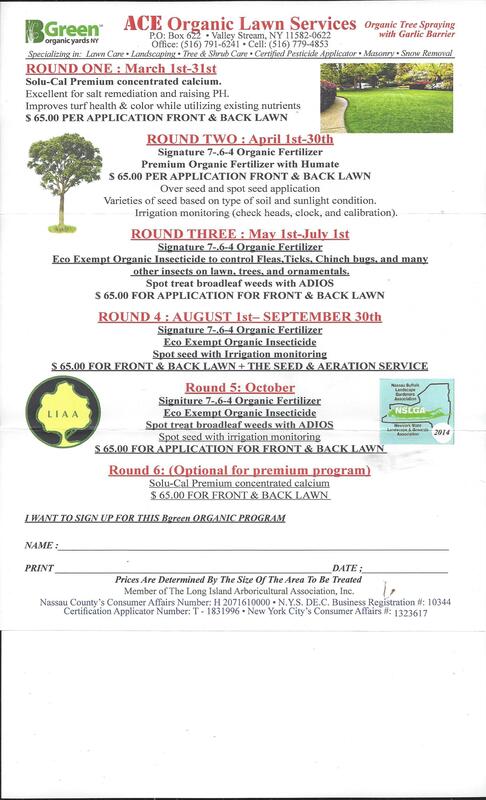 Some diseases such as root rots, stem rots and foliar diebacks can occur. Apricot Delight has flowers white-flushed with apricot and a bright raspberry eye. Blue Pearl is the closest to a blue vinca yet developed. It is a soft lavender blue with a white eye that grows to 18 inches tall. Cooler Series has a uniform growth habit and clear, vibrant colors. Coolers grow to 14 inches tall. Heat Wave Series blooms extra early and grows to only 10 inches tall. Mediterranean is a new series of spreading vinca. They reach only 6 inches tall and spread up to 2 feet wide. They can be used in hanging baskets, window boxes and at the front of the flowerbed. Colors available are lilac and white. Pacifica Series grows to 14 inches tall and has large 2-inch-wide flowers with overlapping petals. This series is well-branched and extra early blooming. It is available in white, pink, rose and light purples with or without contrasting "eyes." 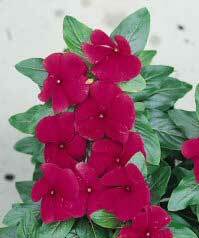 Pacifica Red is the first true red vinca. Passion is a striking, deep orchid purple with a yellow eye. It grows 18 inches tall. Tropicana Series is early blooming and has very large, rounded flowers. They grow to 15 inches or more.